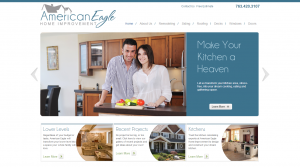 Recently we’ve worked to put together a brand new website, with a fresh, clean look that reflects the amazing quality work that American Eagle Home Improvement offers! The new site makes it easy to view photos of our recent work, learn about our company and request a free remodeling or restoration estimate. This entry was posted in American Eagle Company News, Maple Grove Remodeling Services, Maple Grove Restoration Services and tagged Exterior Restoration Maple Grove, Home Improvement Maple Grove, Maple Grove Bathroom Remodeing, Maple Grove Exterior Remodeling, Maple Grove Home Improvement, Maple Grove Kitchen Remodeling on July 16, 2013 by admin. At American Eagle, we remain focused on the values of family, comfort, and security, because we know it's not just a house...it's your home. Let us help you today with our full-range of home improvement and insurance restoration services. Call us at 763-420-3107 to learn more!